One of my favorite parts of putting together a creative shoot is designing the set. I love the research that goes in to it and creating something new. Last month I contacted a model to see if she was available to do a boudoir shoot. Luckily Nastacia was free and had some great ideas. She suggested that we do a Marie Antoinette styled boudoir shoot. I pulled up Pinterest and immediately began looking for some inspiration. Below is my Pinterest board. Next I started rummaging around to see what I already had to match the theme. Sadly (hahaha) I didn't have everything and so had to run to Hobby Lobby. As always I found so many cool things. I have been drooling over this bird cage for months and finally had a reason to purchase it! Then the hard decisions had to be made. What kind of flowers did I want? The choices are overwhelming some times. Luckily all floral items were half off and I had a 40% off coupon for the bird cage. Shopping on a budget it is important to keep an eye out for sales and coupons! After arriving home I started putting everything together. I knew I wanted the half sphere floral foam so the flowers sat up a bit in the cage. Just had to trim the sides down a bit. Added greenery to give it some texture and hide the foam. Here I used real moss and fake vines. TADA! 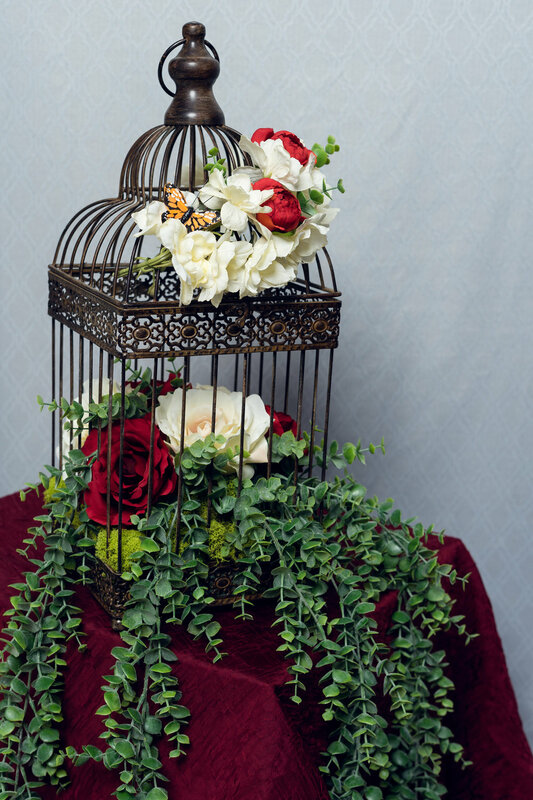 For the final look I added flowers out side the cage and put in a butterfly for an embellishment. I really love how it turned out. The backdrop is a curtain panel I purchased at Kohl's for half off. The red material I already had and used it to hide the boxes the bird cage was sitting on. Nastacia brought some great pieces to add to our look. Below is one of the final images from this shoot. It looks a bit more Spanish than French but I really love how it all turned out. If you are interested in seeing all the images from this set I will be posting a blog soon! Have any questions on how we put this together? Feel free to ask me in the comments. Happy crafting!